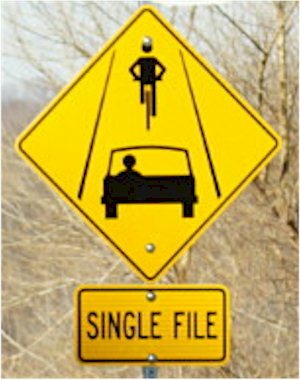 RANTWICK - Commuter Cycling in London Ontario | A Bike Blog: Hey, City of London Department of Transportation Planning and Design! You ^%$**@n' Rock! Hey, City of London Department of Transportation Planning and Design! You ^%$**@n' Rock! I sent email to several of the people who work in Transportation Planning and Design for the City right when I wrote that post on May 2nd. I took the roundabout only two times since then, one of them being last Thursday morning. Look what I saw! I just wanted to thank whoever was kind enough to pay attention to my email and posts. 2 weeks? It got changed in 2 weeks? In municipal government terms, that is outstanding. It almost makes me wonder if I'm not the original cause of the sign change. In any case, I'm really happy with my City's transportation planners right now. People in positions like theirs are often inundated with requests and general whinings about this and that, I'm sure. Some of us (myself included) are often quick to criticize and slow to praise... this post is about my being as quick to praise as I was to complain. Well done, City planners! I must admit, I once emailed the City of London about improving signage in advance of Sarnia and Western Roads eastbound, as I found the lane configuration confusing. I never received a response but a sign was erected in less than a month! Excellent story of a concerned citizen and a responsive government. Nice to find out someone out there pays attention, eh? And pat yourself on the back! Awesome, I'll be sending this to my waterloo region councillors. Thanks!! That's one of the most impressive signs I've ever seen! Bicycle plus car being beamed up to alien ship? Yikes. JRA - Yes, our benevolent space overlords have decided enough is enough and will beam us up to broker a lasting peace between bikes and cars on their interstellar negotiation barge. Good work and great outcome, Patrick! Now that's a nice lookin', straight forward sign! 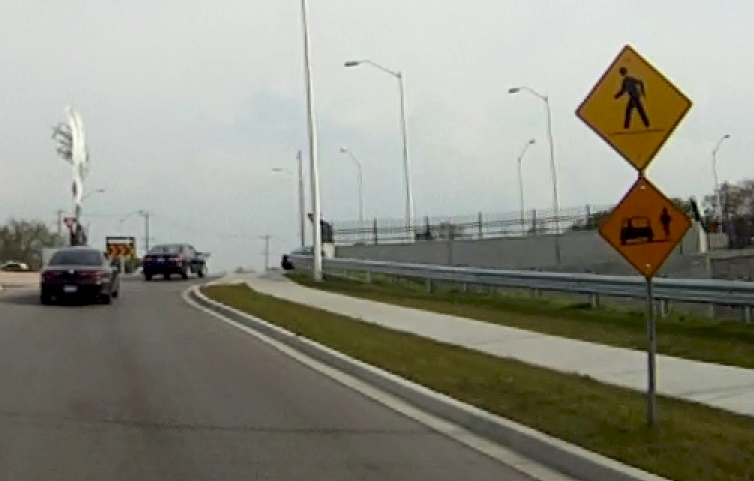 On another note, I also saw your vid with the biker weaving on the path featured on the latest Silly Cyclists. Free bread crumbs, sign-changer, Youtube video series, you've hit the big time!